The Addmen ECAS (Enhances Campus Automation System) is a software that makes administration processes of schools, colleges, etc. easy, efficient and organized. The administrator is given a user name and password to access the account. One system can have multiple users, making it possible for different administrators to manage the processes. However, not many know that this software provides student access too. Upon admission, students can be given their own login and password which would take them to the student dashboard. With this, the students can view and manage several things. Students can view their profile by clicking on the 'My Profile' icon. Apart from this, they can view their ID and print it too. Students can view their attendance record using My Attendance module. Students can use this software to check their assignments and also to submit them after completion. The Course Progress module helps the students to know how much of the syllabus has been completed in the class and how much is remaining. Students can also give feedback about their class, subjects and faculty members through the Feedback module. Online tests uploaded by the admin can be viewed by the student in the interface. Students can take part in the online tests and also view the results here. Personalized reports are available to the students. They can also view and download study material uploaded for them by their teachers or admin. The best thing about this software is that a student would be able to see the documents or study material and other such content that belongs to his/her course and class. The dashboard also provides students the opportunity to check their time table and test schedules. Students also have the opportunity to download practice sheets as well as test solutions. It is possible to pay course fees, check payment details and account ledger as well as take print out of the receipts. Students can also check how they have fared through the Progress Chart module. They can also view the personalized messages sent to them by the admin on their dashboard. The student dashboard can be created for schools, colleges, coaching classes, universities, etc. It is one of the quickest and simplest ways of communicating with the students. 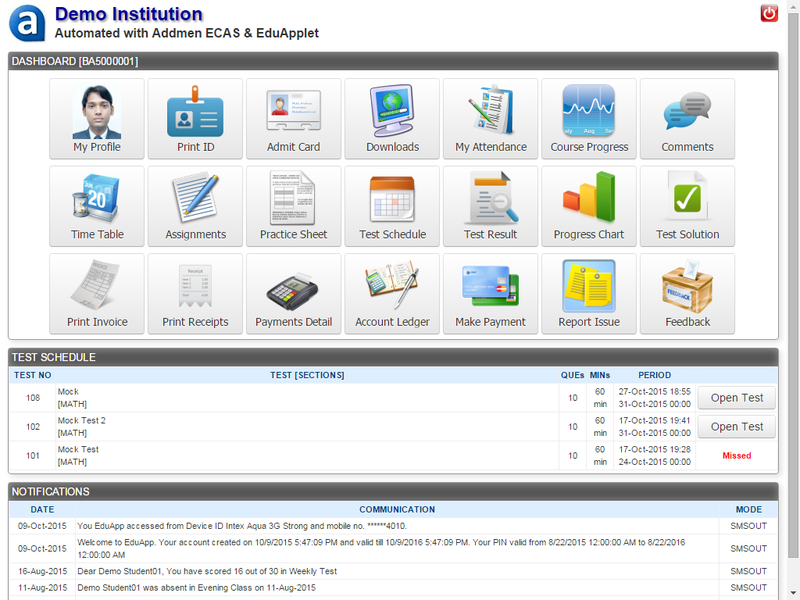 Moreover, you can customize the student interface too by including only those modules which suit your requirements.